Having filtered water readily available to drink is so important for our health and wellbeing. And doesn’t it taste so much better than ordinary water? We recommend choosing the best countertop water filter because they come in a variety of sizes and are a good option for families. Sometimes, water filter pitchers can be too small for large households. 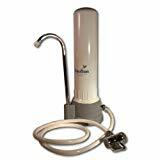 But there are many different types making it hard to choose the best countertop water filter systems- some are compact and attach to your faucet. Others feature a large countertop water filter dispenser like an office water cooler. Which countertop water filter is best? How do you choose the best countertop water filter for home use? We’ve done the hard work for you by researching and choosing our best countertop water filter reviews for 2019. We have all the information here for you, and show you where you can find out price information and make a purchase when you are ready. To help us make the choice, we looked at the best rated countertop water filter on online sites such as Amazon, Quora and Reddit. We looked at the feedback other consumers have made about the countertop water filter systems and also spent hours researching water quality statistics and information. Whether you’re looking for the best rated countertop water filter, the best countertop water filter reviews or the best countertop reverse osmosis system, you can find all the information in our comparison and review post. Nanotrap filter- every 12 months. No replacement filters. Last 5 to 10 years. 1500 gallons or 12 months. It’s important to know more about your city’s water quality. By knowing what contaminants are in your water, you can decide the type of filter to buy. There are filters for different contaminants- there isn’t one filter that can remove everything! To find out more about your city’s water, obtain a copy of a Consumer Confidence Report (CCR) which is available each year by July 1st. This report tells you what’s in your water and where it comes from. You can get the report via the EPA website. If you’re concerned about fluoride in your water, then you’ll need the best countertop reverse osmosis system. We’ve reviewed and included one in this post! Think about the number of people and pets in your household and the amount of water consumed each day. Countertop water filters are suitable for most households, however if you consume a lot of water, then a countertop gravity system might not be the best choice because you must constantly fill it. For high water consumption, a countertop water filter that connects directly to your faucet would be a better choice. It’s a great idea to get some pH strips or testing kit to test if you have acidic water. If the acid levels in your water are high, then you might want to consider purchasing an water ionizer or alkaline water pitcher. Do you have the space for a countertop gravity filter? If not, then the best countertop water filter would be one that directly connects to your faucet. Make sure you consider the space in your kitchen! If you’ve been looking for a countertop water filter and removing fluoride is important to you, there are a couple of options available. There are countertop water filter products that remove some fluoride, but not all. This might be a good solution for you, especially if the fluoride levels in your water aren’t too high. The second option if you want to completely remove almost all traces of fluoride in your water is buying a countertop reverse osmosis water filter. The reverse osmosis membrane in the filter is what traps the fluoride. Reverse osmosis is the only way to completely remove fluoride from your tap water. If you’ve been searching for the best countertop fluoride water filter, then you may know that a reverse osmosis system removes fluoride. Most standard countertop water filtration systems do not use reverse osmosis membranes. However, there are a few countertop reverse osmosis water filters on the market. We think the best countertop reverse osmosis system is the APEC. It features a 4-stage filtration system. Stage 1 is a 5-micron sediment filter that removes dust, rust and other particles. Stage 2 is coconut shell activated carbon filter to remove chlorine, odors, bad tastes, colors and volatile organic compounds. Stage 3 features a high rejection reverse osmosis membrane. It removes up to 99% of total dissolved solids and contaminants including fluoride, chromium, radium, viruses, bacteria and lead. The final stage is another coconut shell activated carbon filter that removes any final residues and tastes. The stage 4 filter can be replaced with an alkaline filter that can be purchased separately from APEC. What we like about the APEC countertop reverse osmosis filter is that it is suitable for people who do not have the space to install a traditional reverse osmosis system with a tank. This could be people who move a lot such as renters and travelers, or people with smaller kitchens. Because of the nature of a reverse osmosis system, there is waste water that is flushed at a ratio of 1 part filtered water to 2 or 3 parts waste water. 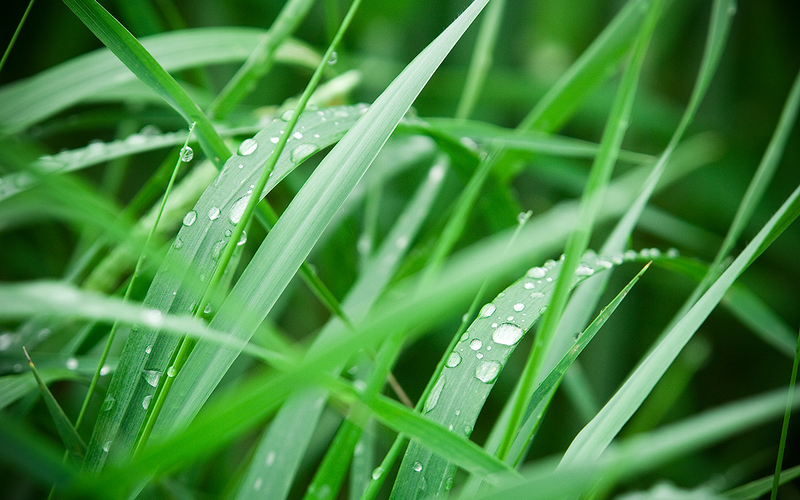 You can collect the waste water and use it on your garden if you wish. It is a light-weight, installation free system that simply plugs in and begins working. It has a filtration capacity of 3 gallons of water per hour. 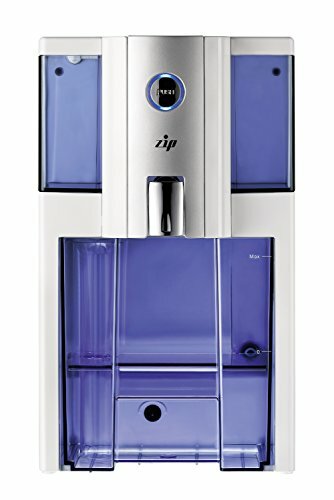 The ZIP countertop reverse osmosis water filter is a high-end reverse osmosis filter that you can sit on your countertop. We couldn’t resist adding it to our list of the best countertop reverse osmosis water filters due to its design and performance. It has a very sleek and modern design and almost looks like a sophisticated coffee machine. In fact it works like a coffee machines- all you need to do is fill the bottom pitcher with water, press the button and walk away. There aren’t any messy hoses or valves that often create problems. If you live in a new apartment or condo this countertop filter will suit your modern kitchen. It’s space efficient. The ZIP turns your tap water into healthy alkaline drinking water and the best part is, there’s no need to install or assemble anything. 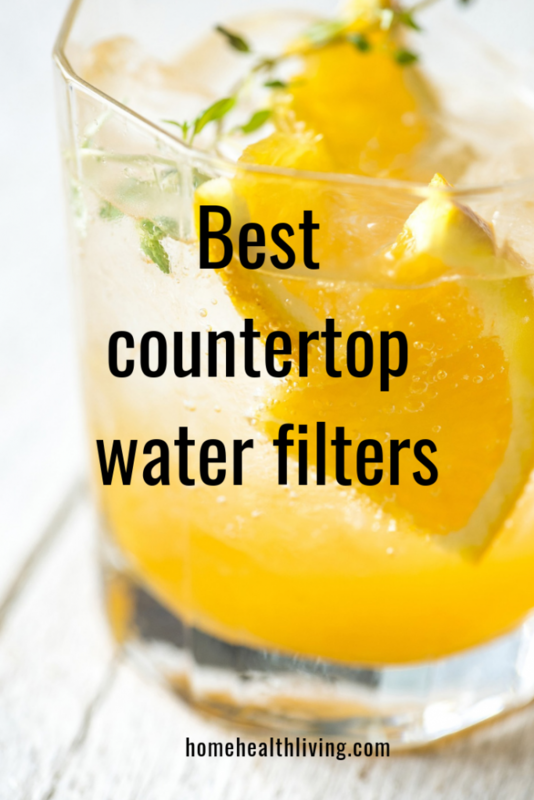 Just simply sit the filter on your countertop and you’re ready to go! The ZIP countertop reverse osmosis filter is BPA-free and removes up to 99% of fluoride, chlorine and heavy metals. A reverse osmosis membrane filter usually removes beneficial minerals, which we don’t always want. The ZIP Alcapure post-filter adds back small amounts of calcium and magnesium to improve the flavor and health benefits. If water alkalinity is important to you, then note that the ZIP filtered water has an alkaline reading of between 7 and 8pH. The first stage filter removes particles like rust and sediment with a five micron sediment filter. The second stage filter removes carcinogens, pesticides, odors and chemical residues via a coconut-based activation carbon block filter. The third stage uses a reverse osmosis membrane which removes any other remaining sediments, chemicals and particles and removes virtually all fluoride. The membrane is what makes the filter a fluoride removal filter. It can filter up to 75 gallons of water per day. The final stage four filter is a post-filter which adds back the essential calcium and magnesium minerals. This filter is known as the AlcaPure Polishing Carbon Post Filter. This filter also increases the alkalinity of the water to between 7-8pH. One of the reasons why it’s on our list of the best countertop reverse osmosis water filters is that it arrives in a box with the filters already installed, so all you need to do is remove the filter from the box and place it on a countertop. Plug the adapter into a power outlet and switch on the power. Before using the water filter, run 2 filtering cycles to flush the filters. Make sure you regularly clean the unit by removing the two water containers and washing them with a light detergent. If have any issues or questions, simply contact the technical support team. There is also a step by step video showing you how to replace the filters once it’s time to change them. A flashing red light will indicate it’s time to replace the filter- this is usually once every 12 months. The reverse osmosis membrane needs to be replaced every 2 years- a steady red light will show on the machine when it’s time to change. All replacement filters are available for purchase on Amazon. 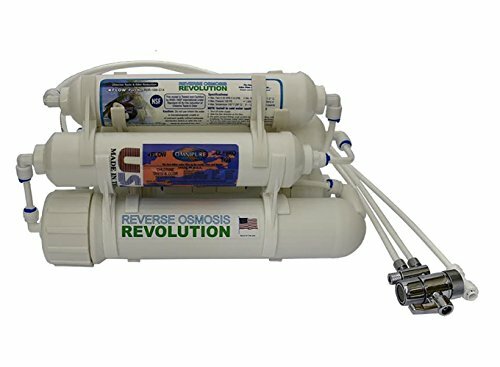 The Reverse Osmosis Revolution’s countertop portable universal water filter has a 5-stage water filter with a deionizing post-filter. We like that the water filter is made in the U.S.A. which guarantees a high quality standard, one of the reasons why we’ve chosen it as one of the best countertop reverse osmosis water filters. The countertop filter can produce up to 3 gallons of filtered water per hour. It removes elements such as aluminium, arsenic, chloride, sodium, potassium, iron, nitrate, mercury, zinc, selenium, lead, fluoride and nickel, and removes many more. It removes more than 600 contaminants. The unit comes with a 2-way diverter for your kitchen faucet. It fits more kitchen faucets. If you need a connection to a garden or laundry hose, if you let customer service know at the time of purchase, they will replace the standard kitchen diverter with a garden/laundry hose adapter. We also like that the filter comes with a TDS water quality testing kit which is great to use beforehand. This will give you an idea of what is in your water. It takes less than a minute to install the filter. You won’t need a plumber to help you and no permanent fixtures are needed. The first stage is a micron sediment filter that removes rust and dust particles. The second stage is a coconut activated carbon filter that removes volatile organic compounds (VOCs), chlorine, odors, colors and unpleasant tastes. The third stage filter is a reverse osmosis membrane made in the USA. It removes 99% of total dissolved solids. It removes arsenic, fluoride, chromium, radium, bacteria, viruses, lead and most other contaminants. The membrane can filter up to 75 gallons of water per day. The final 5th stage filter is a coconut carbon filter. The filtration process is slow due to the reverse osmosis membrane. It takes about 25 minutes to filter 1 gallon of water. This process needs to happen slowly in order to remove as many sediments as possible. Our final choice for the best countertop reverse osmosis water filters is the AquaTru countertop filter. The AquaTru countertop water filter features 4 stages of filtration including reverse osmosis for fluoride removal. The water filter is NSF certified and removes over 15 more contaminants than the top rated pitcher filters. It removes lead, chromium, copper, radium, chlorine and up to 93% of fluoride. Setting up the water filter is easy. It takes about 3 minutes to set everything up. You don’t need to install anything and you certainly won’t need a plumber. You can do it yourself! It’s much easier to set up and use than an under sink water filter. Using the water filter is also easy- there’s a simple dispensing button you press to fill up your glass quickly. The digital display lets you know when it’s time to change the filters. On purchase, the filters come with the unit and last for between 6 months to 2 years depending on your level of use. The filters are easy to replace- they are twist and seal filters and are very quick to change. One gallon of tap water can be filtered in about 15 minutes. When shopping for the best countertop fluoride water filter, make sure you consider the design, price and performance which we’ve outlined in the above reviews. 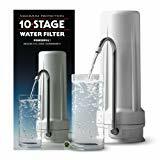 The most important element is that these water filters all contain a membrane filter which is what removes the fluoride and makes it a true reverse osmosis filter. 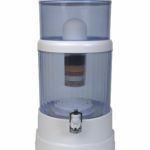 The Cypress countertop water filtration system is one of the most popular and best countertop water filters currently on the market. It has an elegant sleek design which suits most kitchen countertops, and is certified by the WQA (Water Quality Association) as it complies with NSF/ANSI standards. The system has high quality components, including a dedicated faucet diverter. Brondell uses triple filtration technology known as Nanotrap technology. There are 3 separate advanced filters. The first stage filter is a composite-plus filter which is a 2-step filter used to remove sand, rust and fine particles. This filter also acts to protect the following 2 filters by working harder to remove initial sediments. It is recommended that this filter be replaced every 6 months. The second stage filter is a nanotrap filter, which is a patented filter made with 100% USA-sourced materials such as nano alumina and cellulose fibers. This filter has a pore size of 2 microns, and removes many bacteria and viruses, and other particulates. It is recommended that this filter be replaced every 12 months. The final stage filter is a carbon block filter, which further reduces bad tastes, odors, chlorine, VOCs (volatile organic compounds). It is recommended that this filter be replaced every 6 months. The Cypress countertop water filtration system set-up is very simple, with easy installation and no tank required. There is also no water wastage with this system. You can read more about the Big Berkey in our detailed Big Berkey review. 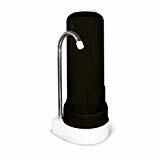 Unlike other countertop water filtration systems that connect to your faucet, the Big Berkey BK4X2 Countertop Water Filter System is a countertop gravity filter. This means that it works like a water cooler, in that gravity pushes the water down into the spigot ready to pour into your glass. It is not connected to a power source or faucet. The Big Berkey comes with 2 black Berkey elements and 2 fluoride filters already included. The Big Berkey removes viruses, cysts, parasites and pathogens. It also reduces the amount of pesticides, herbicides, organic solvents, trihalomethanes and radon in the water, as well as nitrites, nitrates and heavy metals like lead and mercury. The fluoride filters remove most of the fluoride present in the water. I think this is what makes the Big Berkey one of the best countertop water filter fluoride remover. The filters are cleanable and self-sterilizing. You also have the option of choosing how many purification elements you want to include in the Big Berkey. For fluoride removal, you can use up to 2 fluoride filters and arsenic filters. If you’re wondering how many gallons of water the Big Berkey can purify per hour, this depends on the number of purification elements that you use. 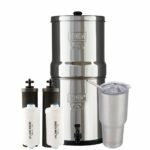 If you use two purification elements, the Big Berkey countertop water filter system purifies up to 3.5 gallons per hour (13.24 litres per hour) while if you use four purification elements, the system can purify up to 7 gallons per hour (26.49 litres). The Big Berkey is made of polished stainless steel and is manufactured in the U.S.A.
More effort required for cleaning to prevent calcium build up. 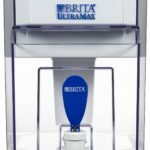 If you’re looking for a Brita countertop water filtration system, then the UltraMax water dispenser is the best option for you. It is Brita’s answer to a countertop filter. 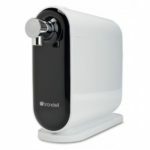 Unlike Brondell’s Cypress countertop water filtration system, the Brita UltraMax is a stand-alone countertop water filter dispenser. It does not connect to your faucet. Instead, you can either leave it sitting on your countertop or in your refrigerator. The spigot makes it easy to pour yourself a glass of water! No heavy lifting of pitchers. 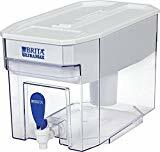 The Brita UltraMax countertop water filter dispenser has an 18-cup capacity, making it an excellent choice for large households. It only uses 1 filter, which is a coconut-based carbon filter with an ion exchange resin, and it is the same water filter used in Brita’s pitchers. The filter reduces chlorine taste and odor, as well as removing copper, cadmium and mercury. Before use, you will need to run the water filter under cold water for around 15 seconds. Once you have installed the filter, you will need to either discard the first 3 dispensers of water, or use the water on plants. There is a sticker indicator that lets you know when it is time to replace the filter, which is generally every 2 months. 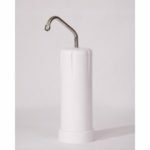 For those who don’t like plastic and prefer a ceramic countertop water filter, then the Doulton UltraCarb is a great option. The UltraCarb micro filter is contained within a ceramic case which has self-sterlizing silver locked within it, stopping bacteria growth. The filter has a carbon block core with ATS resin. The Doulton countertop water filtration system also comes with an UltraCarb ceramic filter candle, which provides for four stages of filtration in a single cartridge that is cleanable. The filter reduces the amount of solids, chlorine, lead and other trace elements present in the water. This improves the odor and taste of the water. The Doulton countertop water filter is NSF certified and tested and approved by the World Health Organisation. It is tested and certified NSF 42 and 53. If you’re looking for the best countertop water filtration system that offers advanced filtration and is portable enough for renters, then the New Wave Enviro may be the best countertop water filter option for you. The unit uses a 10 stage advanced filtration system, that removes chlorine, carcinogenic and chlorine compounds referred to as trihalomethanes, bad odors, cadmium, pesticides, herbicides, asbestos, arsenic, cryptosporidium and giardia. The filter does not remove essential minerals such as magnesium or potassium. This filter does not remove fluoride. Stage 1 is a 30 micron sponge filter to filter out larger sediments and rust. Stage 2 is a patented alloy that removes chlorine and some heavy metals and also helps to prolong the life of the remaining filters. It also acts to prevent the growth of bacteria. Stage 3 is a 10 micron pad filter to remove smaller floating solids. Stage 4 is an ultra-fine mesh filter featuring superior coconut shell and granulated activated carbon. Stage 5’s filter is a 10 micron felt pad that removes any remaining fine sediments. Stage 6 is an ion exchange resin to remove lead. Stage 7 is an additional 30 micron felt pad for extra buffer against any remaining sediments. Stage 8 features G.A.C. that provides extra protection against organic pollutants that may be cancer-causing. Stage 9 features calcite which raises the alkalinity of the water. The final stage 10 is a 1 micron filter to screen out cysts and protozoa. The filter has a capacity of 1500 gallons. The system is easy to install. An optional installation kit can also be purchased at an extra cost if you are wanting to mount the New Wave Enviro under your sink. However, Home Health Living advises that there are better under the sink water filter systems available if this is what you are wanting to do. The Zen Water System is a 7-stage countertop filter system that performs different functions: filters, purifies, mineralizes, alkalinizes and preserves. The Zen is the most thorough countertop water filtration system on the market. Stage 1 is a micro-ceramic filter dome that removes most sediments and larger particles and removes impurities such as pesticides and herbicides. Stage 2 is a granulated activated carbon that is impregnated with silver to stop the growth of bacteria. The granulated activated carbon is treated with oxygen in order to open up all of the pores. This filter reduces chloramines, chlorine, solvents and other heavy metals. Stage 3 is an ionic exchange resin designed to remove toxins and heavy metals, leaving you with purified and softened water. Stage 4 features far infrared balls that ionize and help water molecules once they enter human cells and blood. Stage 5 consists of silica sand, which neutralizes the acidity of the water and removes granular impurities and colloids. Stage 6 consists of mineral sand which enhances your water with nutrients such as selenium, magnesium, copper, zinc, iron and calcium. The final stage 7 consists of mineral stones that further infuse the water with essential minerals and nutrients. Although the Zen countertop water filtration system is thorough, it does require some time to initially set up the system. The mineral stones need to be rinsed, boiled and then dried before the first use, and also every 6 months. They need to be replaced around every 3-5 years. The ceramic dome needs to be soaked and cleaned and the tanks also need to be cleaned prior to the first use, and then on a 6-monthly basis. The Zen water system is BPA-free and does not require any electricity or plumbing. It does need to be placed near the edge of your kitchen counter so that the spigot can be used to fill a cup with water. It takes about 2-3 hours for all of the water to become filtered and ready to drink. There are two tanks within the system, and the tank’s capacity varies depending on which model you purchase. The highest capacity is a total of 8 gallons for both tanks. 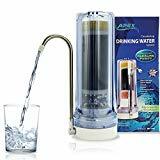 We’ve chosen the Apex countertop drinking water filter as one of our best countertop water filter systems because it not only filters your water but alkalizes it too. The Apex countertop water filter simply connects to your standard faucet (not to be used with pull down or designer faucets) so that your faucet water passes through the 4-stage filter. The Apex can filter up to 750 gallons of water before needing to be replaced. The filter has 4 stages. The first stage removes heavy metals and bacteria. The second stage is granular activated carbon that removes chloramine, chlorine, benzene and organic chemicals. The water then passes through alkaline beads which adds calcium, magnesium and potassium minerals back into your water. The last stage is calcite. Each of the stages is separated by a microfelt pad. The water filter is NSF certified. Apex offers a 30-day money back guarantee and a limited one-year manufacturer’s warranty. The Home Master is a great countertop water filter system because its filter removes up to 93% of fluoride. While this isn’t as much as a reverse osmosis water filter, it’s good to be able to remove fluoride using an easier and cheaper filter. The filter used is a 3-stage filter that needs to be changed after 500 gallons of water has been filtered, or around every 3 months. To use the Home Master, simply connect it to your standard faucet. This countertop filter isn’t suitable for designer or special faucets- only standard faucets are suitable. Home Master offers a limited 3-year warranty on parts. We chose the CleanWater4Less countertop water filtration system because it’s an economic and cost-effective way to filter your water using a countertop filter. There aren’t complicated and expensive filters you need to replace, because the CleanWater4Less lasts up to 10,000 gallons of water before you need to purchase a new one. It simply connects to your existing faucet. The filter inside the unit has five stages but it doesn’t filter fluoride. 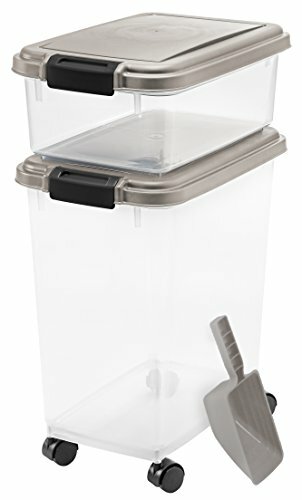 The outer unit has a stylish steel finish with a black lid. Home Health Living chose EcoSoft as one of the best countertop water filters because it comes with a free replacement cartridge which most other models don’t. The European-designed filter is an activated carbon filter which is a single stage filter. It can filter up to 1500 gallons which is approximately 6 months of use before needing to be replaced. Installation is hassle-free and you receive the tools and pieces required to install the water filter yourself. The KOR Waterfall countertop filter is a uniquely designed and attractive countertop filter that uses a carafe to capture the filtered water. The KOR Waterfall is as much about innovative design as it is about filter performance. The package includes 2 glass carafes with caps and you can purchase additional carafes separately. The water filter is a coconut shell filter which filters up to 1280 gallons of water or around 4 months of use. The unit where the filter is can hold up to 1 liter of water at a time. We really love the carafe design. It is compact enough to sit neatly on your countertop or you could place it under your sink. Gravity water filter dispensers, such as the Brita dispensers, are the most common countertop water filters. They use gravity to pull the water through the filter. You simply pour tap water into the dispenser and the water funnels to the filter. The purified water then drips into the bottom chamber ready for you to fill your glass with. 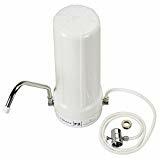 One of the great things about gravity water filter dispensers is that you don’t need to install them and attach them to anything like you would with those that run via your faucet. They are cheaper to buy and are more common. They also hold a lot more water than a standard water filter pitcher. Faucet countertop water filters are those that you attach to your kitchen faucet, with the water filter sitting beside the faucet. As you use your faucet, the water passes through the filter. The main benefit of using a faucet water filter is that you have easier access to fresh, filtered water than if you used a water filter dispenser, which can only hold a certain amount of water. You basically have filtered water “on tap”. Faucet water filters are also easier to install than an under sink water filter, and are cheaper to buy and run. One of the most common features people look for in a water filter is the ability to remove fluoride in the water. To filter fluoride, you need a reverse osmosis water filter system. There are countertop reverse osmosis water filters that sit on your counter as either a dispenser or faucet filter, but have the added charcoal filters that remove fluoride. Water filters with reverse osmosis capabilities are more expensive to buy than standard countertop water filters, and cost more to maintain because you have extra filters that need to be regularly replaced. The best countertop water filtration system for your household depends on a few factors. Once you have read our countertop water filter reviews, you’ll need to consider the following. With the three different options available, you’ll need to decide which is the best type of countertop water filter for your home. When choosing a countertop water filter, one of the first things to consider is the needs of your family or household. If you have a large family that drinks a lot of water, it would be frustrating using a dispenser which only holds a limited capacity. You would need to constantly refill the dispenser and wait for the water to pass through the filter. For a larger family or a household that consumes a lot of water, you would want to choose a faucet countertop water filter. If your water contains large amounts of fluoride, or you are bothered by the taste of fluoride, you’d want to purchase a reverse osmosis water filter for your countertop. Although this option is more expensive, it will meet your requirements for water with miniscule amounts of fluoride. Knowing your budget is also important when choosing the best countertop water filter. For those on a tight budget, a countertop water filter dispenser is the cheapest option as it’s cheaper to buy and doesn’t require installation which can cost money if you need a professional to install it for you. 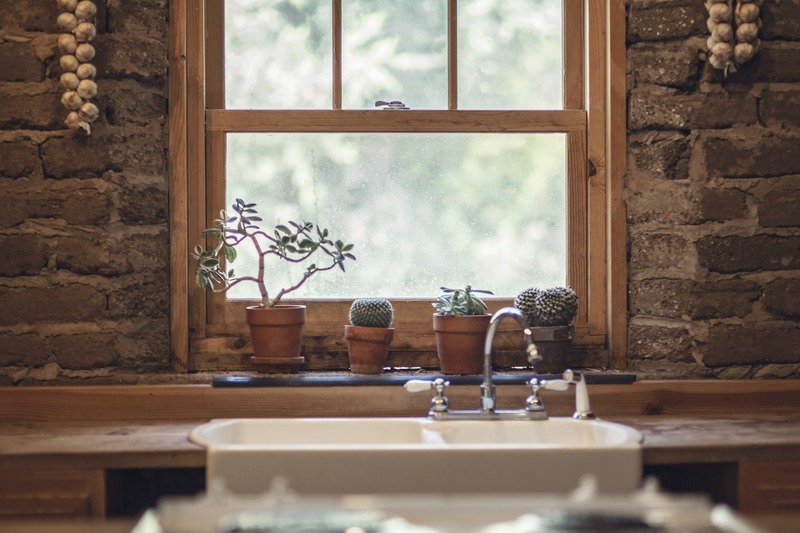 If you have a large household that uses a lot of water, then a countertop water filtration system that is directly connected to your faucet may be your best option. This ensures that you have filtered water ready on tap when you require it. The quality of your source water should help you decide what is the best countertop water filter for you. If your source water is already quite clean, then you may not need a countertop water filtration system with many stages. But if your source water is high in contaminants, then you may require a more advanced and thorough water filter system. This is when the best countertop reverse osmosis system comes in handy, because it removes contaminants that other systems don’t. This will leave you with better tasting water for your drinks, cooking, tea and coffee- filtered water makes your coffee and tea taste better. If you want countertop water filters that remove fluoride from your drinking water, then the only option for you would be a countertop reverse osmosis water filter system. The reverse osmosis membrane is what helps remove the fluoride in water. 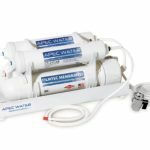 As we mentioned in our review, we think the best countertop reverse osmosis water filter is the Apec. You need to consider both the initial cost of the countertop water filtration system, as well as replacement cartridges. Filters that have numerous stages cost more to replace. Also consider the water wastage, as this will cost you money as well. You need to consider the amount of kitchen space you have available. If countertop space is limited, then you may need to consider purchasing an under the sink water filter system instead. Or in the very least, use a small countertop water filter. Our countertop water filter reviews show that there are many different countertop water filtration systems and their performance depends on the number and quality of water filter cartridges. A countertop system is a better choice if you have previously owned and used a water filter pitcher and found that this didn’t provide enough filtered water for your family. A countertop system allows access to a larger amount of filtered water. And there are some stylish and simple options available for every budget. Disclaimer: This post contains affiliate links. If you make a purchase via these links, we may be paid a small commission at no extra cost to you.